Get out your pen and paper. Let's write! Have you written a "Where I'm From" poem? For many young writers, this form is their first taste of writing poetry. The teacher passes out a template and the kids fill in the blanks to create their poem. Sounds like amateur hour, right? Yes, but stick with me. These poems are fun for all ages. I recently attended a long and tedious professional conference (nothing to do with writing) and toward the end of the session the instructor handed out the tired old templates. I groaned but played along — and it turned out this short writing session was the best part of the day. So, yes, give it a try. Feel free to condense, expand and rearrange your responses. Let this be the door that opens you to a poem. And then, let it take you even further. Poetry lore says this form was created in the 1990s by George Ella Lyon, Kentucky Poet Laureate 2015-2016. "The process was too rich and too much fun to give up after only one poem," she explains on her website. 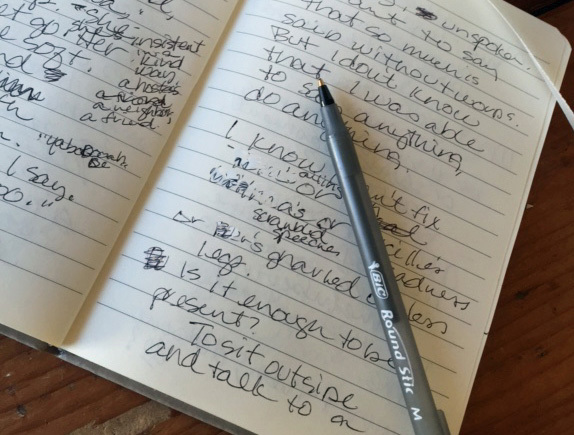 "I decided to try it as an exercise with other writers, and it immediately took off. The list form is simple and familiar, and the question of where you are from reaches deep." "While you can revise (edit, extend, rearrange) your Where I'm From list into a poem, you can also see it as a corridor of doors opening onto further knowledge and other kinds of writing. The key is to let yourself explore these rooms. Don't rush to decide what kind of writing you're going to do or to revise or finish a piece. Let your goal be the writing itself. Learn to let it lead you." from Sun-In summers and waffle-stomp winters. and Cindra, best sister and friend. Your turn. Where are you from? Please share your poem in the comments section.